Being a mom is hectic. Living with a chronic illness is exhausting. When you combine the two, sometimes the idea of getting dinner on the table in the evening feels monumental. Those are the days where I've grown to love my deep freezer and my crockpot. On a day when I am feeling decent and have a bit of extra energy, I'll prepare and freeze a batch of meals. Then, on days when I'm short on energy or need a break from cooking, all I have to do is pop the meal in the crockpot and dinner is ready! 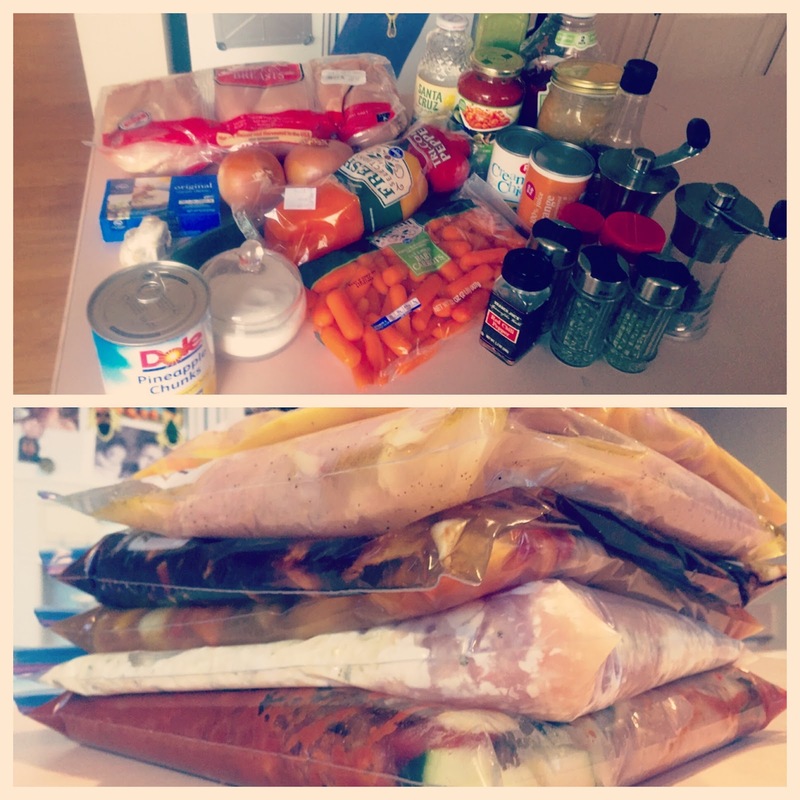 If you haven't tried freezer/crockpot cooking yet, I highly recommend it and I can offer you a simple starting point. A good friend of mine is about to have her second baby, but since we live in different states I couldn't help her prep food before the baby's arrival. 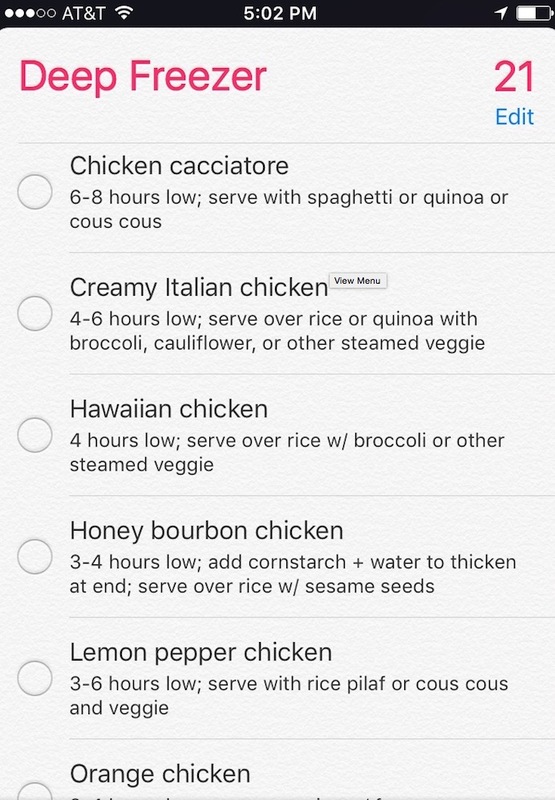 Instead, I wrote up this shopping list and instructions to make it as easy as humanly possible to get six different chicken crockpot meals prepared and frozen. Now my friend will have these meals on hand for after her baby is born! While these meals do require you to prepare rice or noodles and possibly a steamed veggie on the day you serve it, that is a lot less effort than preparing a whole meal! And the glorious part of this particular batch cook is that it is really simple and streamlined - after I got all the ingredients it took me less than 40 minutes to prep six different meals, despite arthritis hands during chopping! I thought some of you might also be interested in trying it, so I'm sharing the shopping list and instructions below. You could always double it and end up with 12 meals too! Also (and here's an organized nerd alert here, guys!) I keep a list of what I currently have in my freezer on my phone - so that anytime I'm trying to figure out what to do for dinner I can just check the list. Otherwise stuff would get lost in the freezer forever - especially the chest freezer! I like to include cooking time and serving suggestions right on the list, so I always know how much effort my choice will take in advance.